Are you considering to purchase a Second Home? Your work hard and sometimes you need to reward yourself for all the sacrifices. Owning a second home is easier than you think. We can help you finance your Second home and pave that way. Your loved ones will appreciate it. Perhaps it is a vacation property you have been dreaming about. We can help you realize that dream too. What is the least down payment for a Second Home? At least 5% of the sale price of your home. If you have 5 to 19% down payment, you will need mortgage insurance. No mortgage insurance, if your down payment is 20% or more. If credit is bad or challenged, you will need at least 20% down. Sometimes we can find a mortgage solution with only 15% down if the home is in a major city. A mortgage on a second home or vacation property. A family member must occupy a 2nd home, rent free. What is the most important step for a second home buyer? You need to qualify by affording the mortgage payments, property tax and heating costs on 2 homes. It is best to get pre qualified by a mortgage broker or bank before you decide to look for a property. We would be happy to discuss this with you. We help you determine your qualification and how much of a home you can afford. We give unbiased, professional advice. We find you the options and products best suited to your needs. 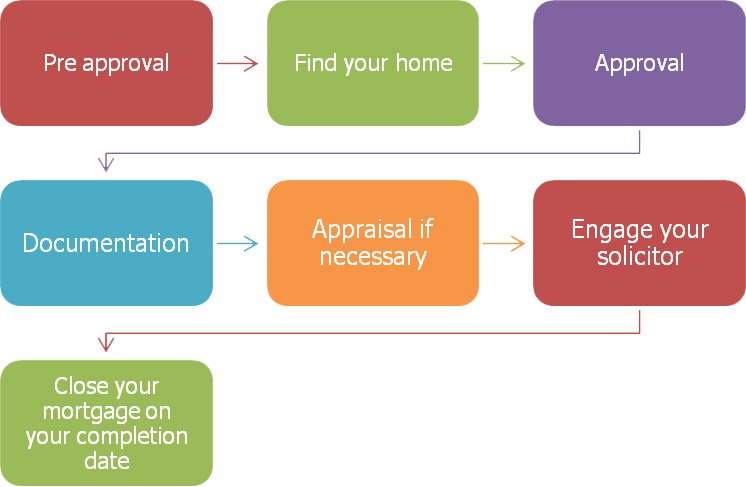 Here’s a simple illustration on how we will secure your mortgage. For more information on our second home mortgage solutions, call us today 1-877 237-2601 or fill out our online contact form.